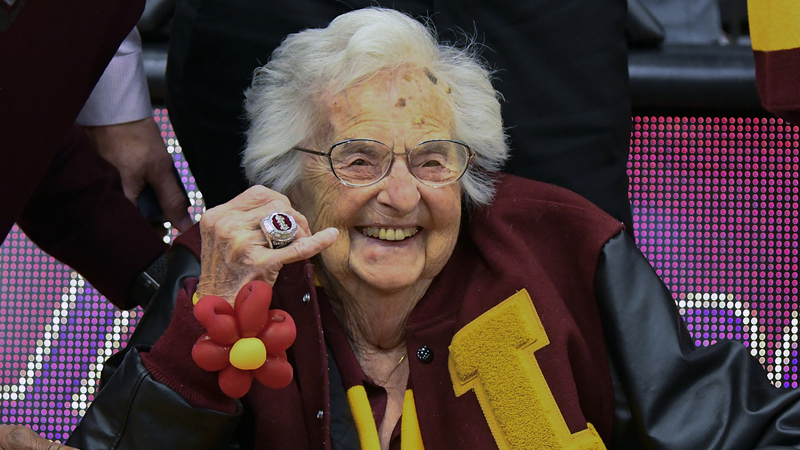 CHICAGO (AP) — Sister Jean Dolores Schmidt now has a little bling to go along with the international attention she gained as the near-centenarian team chaplain during Loyola-Chicago's run to the NCAA Final Four. Loyola great Jerry Harkness, who was a member of its 1963 championship team, helped present a Final Four ring Tuesday night to Schmidt before the Rambler's rematch of their NCAA Tournament game against Nevada. Schmidt, who turned 99 in August, sat in a wheelchair courtside for the presentation. She joked afterward that she felt as if the ring added five pounds to her weight. The Catholic nun became a celebrity last March for her fandom and for praying before each game for her Ramblers — and for their opponents.